This item is no longer in AADL's Collection. Interesting--but not very? submitted by bfields on November 4, 2012, 8:56pm I was curious to play a Theremin, so I'm glad the library has these! It's a lovely-looking instrument, and the sound is pleasant and clean, but a little boring. It's fun, at least for a while, to control the sound by waving your hands around in the air. But after the novelty wore off I lost interest. You can make warbly swoopy sound effects, but I wasn't able to find much variety there. You could try to learn to control the pitch and articulation accurately enough to play melodies, and I could see that being a fun challenge, but it would also take a while to really master, and it didn't seem worth it to me for a monophonic instrument without a lot of character to the sound. But others may find it more inspiring! Inspired by New Orleans Bingo! Show @ Summer Fest 2013? submitted by choatec on June 18, 2013, 8:21pm Then check out this theremin & give it a try! Quite an Interesting Instrument submitted by 0liviap0pp on August 1, 2014, 1:33pm I personally think this is a really neat instrument. 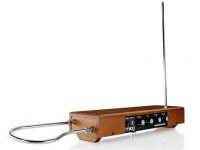 When Sheldon plays the theremin on the Big Bang Theory, that got me intrigued about this instrument that's not too new but not many people know about it. I will definitely check it out if it's available and play around! Fun but difficult submitted by pk on August 13, 2014, 8:40pm Other reviewers have a point. The Theramin is a fascinating instrument and a lot of fun to experiment with. it is, however, difficult to play well. You can goof around and get different sounds, learn how to move your hands to achieve certain sounds, but playing real tunes is difficult. It would require a lot of practice. So get it for the novelty and fun, but don't expect to play it well. Good Challenge submitted by Susan Haines on August 2, 2016, 5:16pm Fun but much more difficult than it looks.